If you still haven’t decided whether you’re going to get the Asus EEE PC 901 or the HP Mini Note, here’s another notebook to add to your choices: the Acer Aspire One. Before the Asus EEE PC, we all thought that ultraportable notebook prices will always be pegged at $900 and above but Asus sure proved them wrong. The Acer Aspire One has an 8.9 inch CrystalBrite LED display with a resolution of 1024 x 600 pixels. The processor on this notebook is an Intel Atom processor, it can also be equipped with a 512MB or 1GB memory, and users can choose between an 8GB NAND Flash drive or a conventional 80GB hard disk drive. Probably what sets the Acer Aspire One apart from the other two cheap ultraportable laptops is that it has the capacity to read different memory cards such as Secure Digital, MultiMediaCard, Memory Stick, Memory Stick PRO, and xD-Picture Card whilst the other two is only restricted to reading SD and MMC cards. Another good feature according to Acer (if Acer remains true to their word), is that the Acer Aspire One may be specified with 3G wireless technology, a feature that even some expensive ultraportables are lacking. The Acer Aspire One also has WiFi and an integrated camera. The Acer Aspire one can be configured to have the Linpus Linux Lite or Windows XP Home. Pre-installed software depending on your OS includes: OpenOffice 2.3, one Mail, Messenger, Acer eRecovery Management, Acer Launch Manager, Adobe Reader, McAfee Internet Security Suite, and Microsoft Office Trial 2007. Price for the Acer Aspire One will start at $379 and it will be available in four colors: sapphire blue, seashell white, golden brown and coral pink. 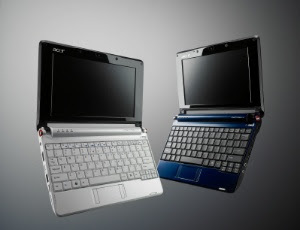 The Acer Aspire One is expected to be available in the third quarter of 2008.